Fee's Little Craft Studio: Gorgeous Quilt ! Have you seen this gorgeous quilt yet? 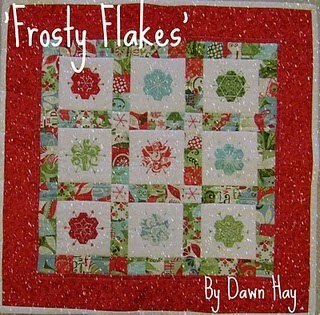 It is a FREE Block of The Week by the delightful Dawn. Pop over here to download your FREE blocks NOW !! I have been collecting Frasty Flakes. They do look gorgeous together. Isn't it stunning? I haven't even started yet - but I'm anxious to get going with it! Can't wait to see your surprise, hon!